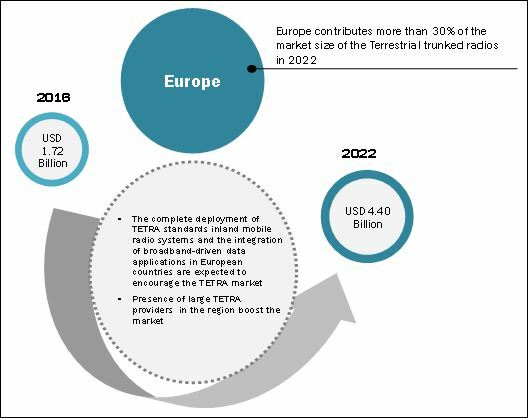 [143 Pages Report] The terrestrial trunked radio (TETRA) market is expected to reach USD 4.40 Billion by 2022, at a CAGR of 17.08% between 2017 and 2022. The overall terrestrial trunked radio market is driven by factors such as the transition of radio communication devices from analog to digital and growing use of mobile radio communications in the transportation industry. For this study, the base year considered is 2016 and the market forecast is provided for 2017–2022. The global TETRA market size is projected to reach 4.40 billion by 2022 largely due to the increased requirement for efficient critical communication in public safety applications. TETRA technology offers outstanding features to mobile communication, by combining the features of mobile cellular phones with fast data communication and the workgroup capabilities of PMR. Several TETRA manufacturers offer installation and maintenance networks and services for end-user applications. For instance, in March 2015, Motorola Solutions, Inc. (US) launched an entire MTP3000 series of TETRA with more durability, greater audio clarity, and improved coverage and connectivity features for mission-critical users. The companies present in the TETRA market focus on acquisitions and contracts to enhance their customer base pertaining to the TETRA business. For example, in January 2015, Airbus Defence and Space (France) received a contract from the Ministry of Interior of Lebanon for a Terrestrial Trunked Radio (Tetra) Communication System for the country’s General Directorate of General Security (GDGS). The contract includes the delivery of TETRA switches, base stations, dispatcher workstations, and more than 2,000 radio terminals for Lebanese security forces. 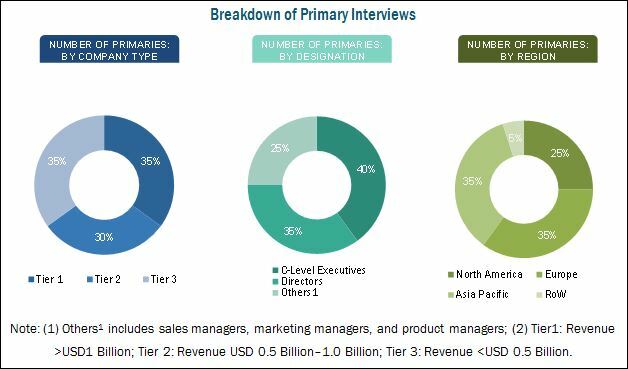 This report provides a detailed analysis of the terrestrial trunked radio market by component, device type, application, and geography North America, Europe, Asia Pacific (APAC), and Rest of the World (RoW). The report provides detailed information regarding the major factors influencing the growth of the market (drivers, restraints, opportunities, and challenges). The main driver for the terrestrial trunked radio market is the growing demand of critical communications operations in industries such as public safety and commercial. The report also profiles the key players and comprehensively analyzes their market ranking and core competencies, along with details of the competitive landscape of the market leaders. 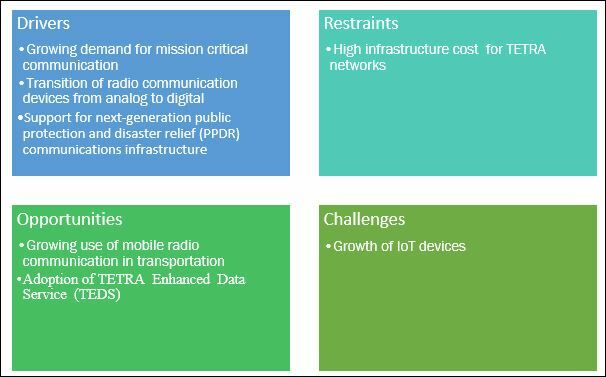 To estimate the size of the terrestrial trunked radio market, top-down and bottom-up approaches have been used. This research study involves extensive reference to secondary sources, directories, and paid databases such as Factiva and OneSource to identify and collect information useful to study the technical, market-oriented, and commercial aspects of terrestrial trunked radio. The research methodology is explained below. This entire research methodology includes the study of annual and financial reports of the top players, presentations, press releases, journals, paid databases, and interviews with industry experts. The high-growth segments have been identified to analyze opportunities in the overall market. Competitive developments, such as contracts, agreement and acquisitions, new product developments, and research and development (R&D), in the overall terrestrial trunked radio market have been analyzed. All the percentage splits and breakdowns of the market segments have been analyzed based on secondary and primary research. The following figure depicts the breakdown of the primaries by company type, designation, and region during the research study. This report provides valuable insights regarding the ecosystem of the terrestrial trunked radio market. This includes component manufacturers (Motorola Solutions, Inc. (US), Airbus Defense and Space Corporation (France), Hytera Communications Corporation Limited (China), JVCKENWOOD Corporation (Japan), Sepura PLC (UK), and Simoco Group (UK)); software components (DAMM Cellular Systems A/S (Denmark), Rohill Engineering B.V. (Netherlands), Bitea Limited (UK)); and application areas. This study answers several questions of stakeholders with regard to the market segments to focus on during the next 2–5 years to prioritize efforts and investments. This research report categorizes the overall terrestrial trunked radio market by component, device type, application, and geography. This report segments the TETRA market comprehensively and provides the closest market size estimations for segments across different regions. The report would help stakeholders understand the pulse of the market and provide them with the information on key drivers, restraints, challenges, and opportunities for the market growth. This report would help stakeholders understand their competitors better and gain insights to improve their position in the business. The competitive landscape section includes the competitor ecosystem, product launches, acquisitions, expansions, partnerships, contracts, and agreements. Also there is a long list of product launches and advanced technologies implementation for a range of solutions for securing communications in different public safety and commercial applications in TETRA market. 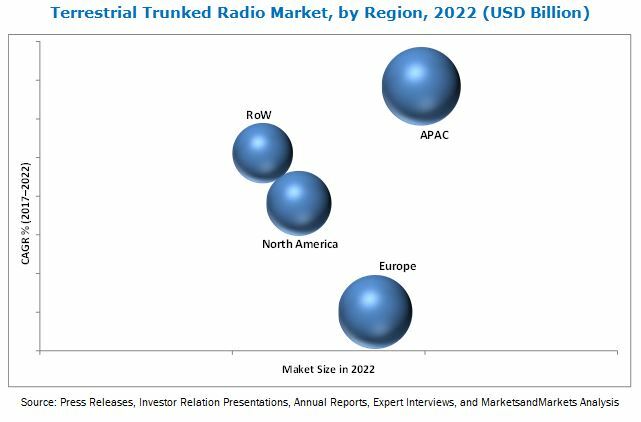 The terrestrial trunked radio (TETRA) market is expected to be worth USD 4.40 Billion by 2022, at a CAGR of 17.08% between 2017 and 2022. Factors such as growing demand for mission critical communications and growing use of mobile radio communications in the transportation industry could lead to significant opportunities for this market in the near future. TETRA is the largest land mobile radio standard, has good spectrum efficiency, and extraordinary critical communication features—such as security, short call set-up time, voice calls feature set, and high-speed data services on direct mode and site trunking. Its adoption is growing in existing and potential market segments, such as public safety and commercial applications. The terrestrial trunked radio market has also been segmented by component into hardware and software. The implementation of software application for text messaging, automatic position messages, remoting radio monitor, accessing voice, and data information is leading to increased demand for software component in the TETRA market. Portable devices are expected to experience high growth between 2017 and 2002. As portable radios are handy and easy to use, demand for portable devices using TETRA technology will boost the terrestrial trunked radio market in the near future. In 2016, public safety application accounted for the largest share of the terrestrial trunked radio market, followed by commercial application. The market for military and defense is expected to grow at a high rate between 2017 and 2022. The growing need for efficient critical communications in military and defense, home security, emergency and medical services, and fire department is expected to drive the growth of this market. Also, the growing use of mobile radios in transportation and utilities applications will likely lead to the growth of the TETRA market for commercial application. APAC is expected to hold the largest share of the terrestrial trunked radio market in 2022. The huge population base, increasing adoption of TETRA networks, research and development (R&D) activities, and increasing focus on critical communications operations are driving the growth of the market in APAC. The use of mobile radios in the commercial sector, mainly in transportation and utility applications, is the major factor driving the growth of the market in APAC. The key restraining factor in the terrestrial trunked radio market is the high infrastructure cost for TETRA networks in this market. TETRA was designed to cover the PAMR market with every conceivable feature; as a result, complexity and development costs ended up being the highest contributors to the cost of the final product. Fast and dedicated switch nodes (which are expensive) are required for multiple subscriber interactions in a TETRA infrastructure. The number of sites required to perform the same coverage of an existing analog system may be two times or more. More sites require higher initial investment, with a fixed cost of maintenance, site rent, frequency license, and backbone links. Expensive hardware is required for liner modulation. Moreover, a new mobile radio and antenna package can cost up to USD 5,000, which is outside the budget of many. TETRA technology requires extensive testing, which increases the overall development cost of the product. Owing to this, the present demand for and supply of TETRA solutions are less. Motorola Solutions, Inc. (US) is a leading global provider of mission critical communication infrastructure, devices, software, accessories, and services. The company is focusing on the development of advanced terrestrial trunked radios and technology to strengthen its position. The company has sales offices with additional representation via a network of distributors across the globe. *Top 25 Companies Analyzed for This Study are – Motorola Solutions, Inc.; Hytera Communications Corporation Ltd.; Sepura PLC; Airbus Defence and Space OY; Jvckenwood Corporation; Simoco Group; DAMM Cellular Systems A/S; Rohill Engineering B.V.; Rolta India Limited; BiTEA Limited; Selex Es S.P.A; Alcatel-Lucent (Nokia Networks); Teltronic Sau; Powertrunk, Inc.; Thales Group; Mentura Group OY; Procom A/S; Rohde & Schwarz GmbH & Co.; Ervocom International Ag; Artevea Digital India Pvt. Limited; Tianjin Communication & Broadcast Group Co., Ltd.; Danimex Communication; Consort Digital Pvt. Ltd.; American International Radio, Inc.; and NPO Angstrem, PAO. 14.12.2 Tianjin Communication & Broadcast Group Co., Ltd.
14.12.3 Consort Digital Pvt. Ltd.